Our company is recognized as one of the prominent Stone Gabion Manufacturers in India. The Stone Cage Gabion offered by us is manufactured using high galvanized low carbon steel wire or interwisted wire by double intertwisting with machine or forming hexagonal structure meeting the requirements of the clients. 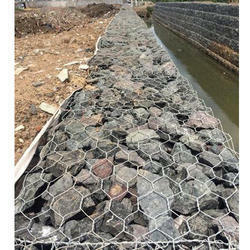 The Stone Gabion Wire Mesh is coated with specially optimized high anticorrosive resin film (PVC or PE) to make them competent to perform in river area with antirust, weathering proof, anticorrosion, pressure-proof, cutting-proof and good protective function in seriously polluted environment. Stone gabion is made of high galvanized low carbon steel wire or interwisted wire by double intertwisting with machine or forming hexagonal structure. The quality conforms to the industrial standard. The resin stone gabion is made of galvanized hexagonal steel wire coated with specially optimized high anticorrosive resin film(PVC or PE). The plastic macromolecule optimized resin plastic compound, after many compounding processes, applies in river area with antirust, weathering proof, anticorrosion, pressure-proof, cutting-proof and good protective function in seriously polluted environment. The development and cotrol of the river-ways concerns the technology of laying protective layer, with permanent protective function, on sections. The stone gabion can control water flowing volume and protect water resource fron running off in holding the neighboring water resource and protecting and controlling the zoology. Strengthening the stability of the river beds. Protecting riverbeds from being washed away. Providing the prefixed value of coarseness nodulus of river banks. Protecting the trees and zoology of slopes and banks. Good adaptability adapting to the deformation of the groundwork. High flexibility not likely to be broken, bearing a large range of deformation without collapsing. Anticorrosive and washing-away-resisting, high resistance to natural damage, bad climate, quake and impact. With both penetratability and non-penetratability, damage caused by fluid static power is prevented. Available for growth and beautificatin of vegetation with the mud in the stone gaps, merging an organic whole with the surroudings. Easy construction, not needing special technique, only putting stones into the gabions and tiding the gabion opening. Saving transport fees: folded when transported and assembled on the work site.